The first weekend in May is always party time for my best big girl. And this year was a biggie. She celebrated turning 5 years old!!! 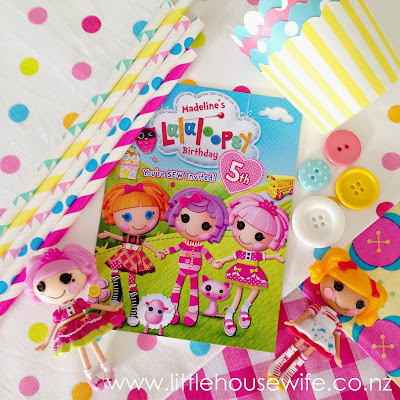 We toyed with several themes - it was very nearly a hula girl party (would LOVE to do that one year) and almost a Jem and the Holograms party (had some brilliant ideas for this too) but we settled on her favourite - Lalaloopsy. I ordered this customized invitation from Timothy Workshop on Etsy and created a flat lay around it of colours and patterns I wanted to run with at the party. It was my inspiration to refer back to while I pulled everything together. She rattled off the names of no less than 25 (Yes! 25!) 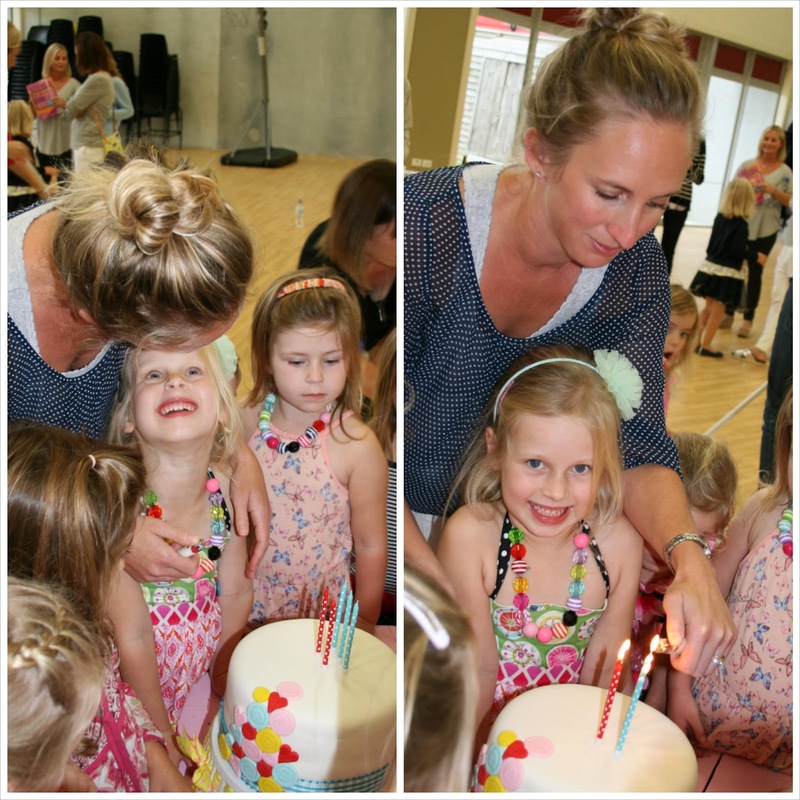 kids she'd like to invite (because turning 5 is a really big deal) to her party. Eek! The thought of that many 4 and 5 year old kids in my house gives me the horrors so we booked the same hall that we used for her 3rd birthday Cinderella Party. Hosting a party at an external venue presents some challenges but I was well organised and kept things simple so it all worked out really well. For an easy table backdrop I bought some cheap plain and polka dot paper plates from Look Sharp Store and stickered them with black dots to make them look like buttons. They were really quick and easy to bluetack up behind the trestle table. I didn't want to be hauling too much stuff to and from the venue so I kept the main table really simple. The centrepiece was the birthday cake I made - a really simple madeira cake covered with white fondant with a trail of heart and circle fondant buttons. It was so basic and by far the easiest cake I've ever made. I think simple looks best and I was really happy with it. 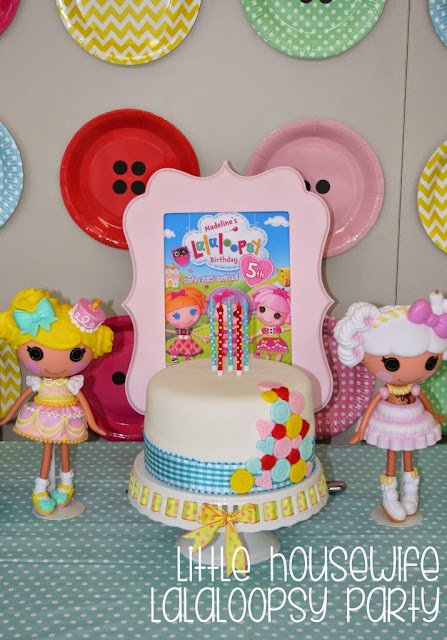 Behind the cake and Lalaloopsy dolls was a framed enlargement of the party invitation. I've been working on making my own range of hand made frames to sell for a while now and this is one of the them. They'll be ready for sale soon. I'm just working on a few final details. More info soon or message me for details. At each end of the trestle table I placed a cheap house shaped shadow box with small Lalaloopsy dolls and balls of wool which I made by wrapping wool around a polystyrene ball. On the right I also placed the custom party hat I made for Maddie on a small cake stand. The birthday girl posing in front of the table. Her 2 year old sister eyeing up what mischief she can get in to! To keep things simple and easy with the food, I made each of the kids their own little lunchbox. I did this for Maddie's Cinderella Party too and it is one of my favourite ideas ever. Little kids don't actually eat that much at parties at all so this way nothing goes to waste. And it is so much easier than putting out platters and trays of food. This was the lunchbox production line. Each lunch box included a baking cup of fruit flavoured popcorn, a baking cup of grapes and blueberries, a biscuit cotton reel (a marshmallow iced between two mini hundreds and thousands biscuits), fruit puff slice and two mini heart shaped sandwiches. So easy! I bought a cheap white ladder shelf﻿ from In Stock to stack the lunchboxes on. I bought a big wooden electrical cable spool off Trade Me which I painted pink and white. I thought it looked like a giant cotton reel. I used it to hold the water bottles and to place the cake on later when we sung sing happy birthday. It was just the right height of all those little 4 and 5 year olds. I designed the water bottle labels and printed them on A4 labels from the $2 Shop. For the adults we served sushi from Sushi Mania which is my absolute favourite, best ever sushi eatery ever! And we were fabulously lucky to have Hopt Soda sponsor all of the adult beverages. They were a huge hit. So many positive comments here! Everyone loved them! Thank you so much Hopt Soda! We had three activity tables for the kids to complete. The first was to "Create-A-Lalaloopsy". I purchased a printable Lalaloopsy outline template from Design is Priceless on Etsy. 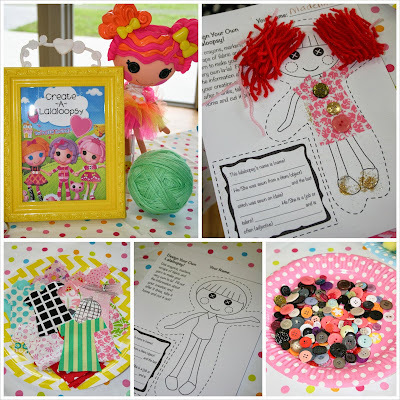 I cut out a whole heap of dresses for everyone to choose from as well as plates of wool (for hair), buttons, pom poms and glitter to glue on so they could all create their own, unique Lalaloopsy doll. This was a very busy, messy table! My beautiful birthday girl creating her Lalaloopsy doll (and adjusting her headband!). 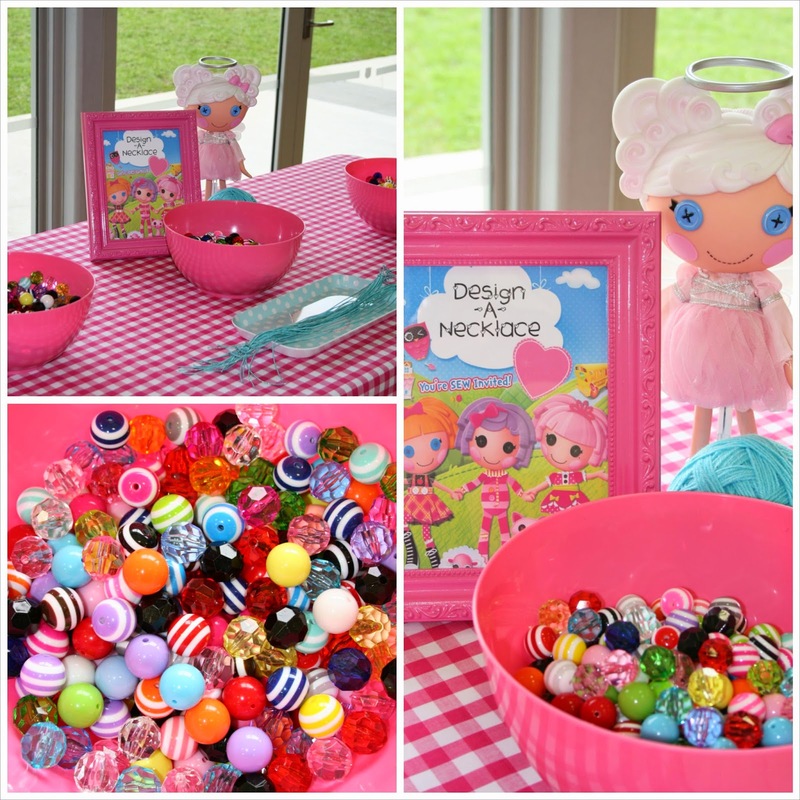 The second table was to "Design-A-Necklace". I purchased a whole lot of bubble gum beads from DHGate and some sturdy elastic from Ikes Emporium. I absolutely adored seeing each of the kids (both the boys and girls!) wearing their big, bright bubble gum necklaces! Maddie with her best friend (and cousin) Archie - wearing their awesome bubble gum necklaces! And the third table was "Decorate-A-Cookie". It was supposed to be "Decorate-A-Cupcake" but the cupcake liners all pulled away from the cupcakes and the OCD in me couldn't handle it. 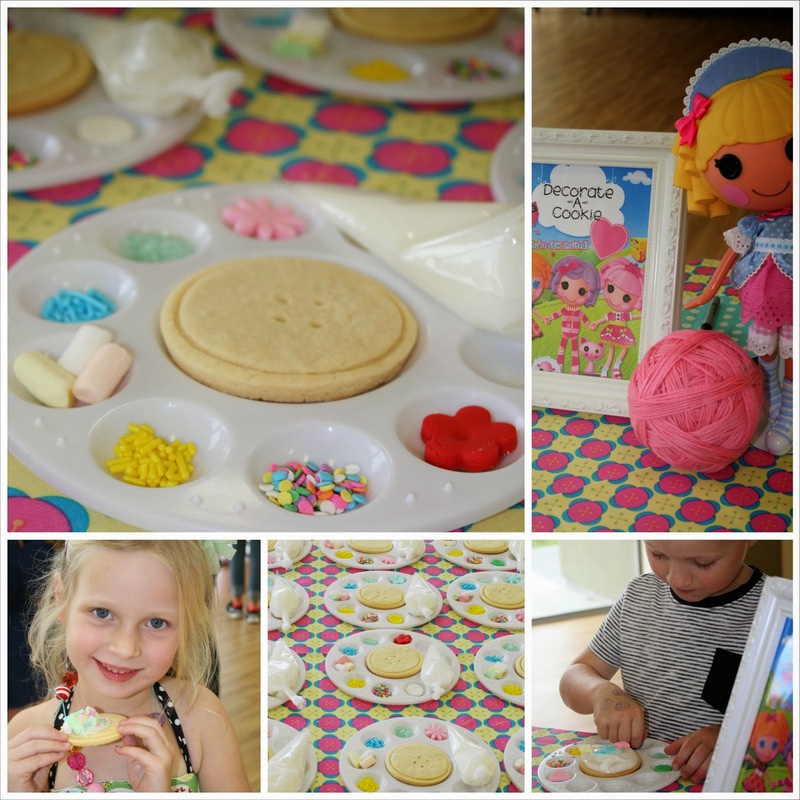 So I changed it to decorating button shaped cookies instead which actually worked out way better as they were a much better size for the kids and not too filling so there was still room for afternoon tea afterwards. Each of the kids got their own little icing bag and a paint palette with their cookie and some sprinkles and fondant shapes. The concentration on the kids faces while they were decorating their cookies was adorable! After a very very very long game of pass the parcel (25 is a lot of kids to get through!) it was time to sing happy birthday. Mads thought it was really funny to blow the candles out as I was trying to light them! Cheeky monkey! And, there was a surprise when I cut in to the cake - rainbow polka dots! Two hours had passed really quickly and before we knew it, it was time to hand out the goodie bags and start to pack up. We were so incredibly lucky to have Planet Fun sponsor our goodie bags. Each of the kids were given a set of Lalaloopsy Minis! How cool is that? Thank you so much Planet Fun! The girls were all absolutely giddy when they saw what was inside! I think I say this every year but this was my favourite party yet! It was so easy. The fact that it was hosted in a hall meant everything was set up in advance, the lunchboxes meant I wasn't serving food or worrying about dishes and I got to enjoy the whole event. A huge thank you again for Planet Fun and Hopt Soda for sponsoring our event plus to all Maddie's little friends who came along and celebrated this special day with us.